There’s more to a website than just design. For a website to be a successful marketing tool to business owners, it needs to go beyond the placeholder status. You need content. Valuable web content. Let’s look at your site from another perspective; every visitor seeks out a website with a question in mind. Maybe they’re looking for location or contact information. Your visitor could be looking for details about a product or service and want to verify that you can get the job done for them. Or, they could be looking for an expert. We call them web authorities, offering tips, guides and vast amounts of knowledge that keep readers engaged and visiting your site over and over. If you don’t have incredible web content, you may lose traffic and potential sales. Your visitors demand a useful, beautiful and friendly website. It all starts with content. Good news! The NHL website is still ugly and terrible and the team pages are in the same horrible format as the main page! Hard to read. Difficult to navigate. Not only did these customers leave frustrated, and most likely without a purchase, they tweeted about their awful experience. That bad PR can stick — as they say, the internet never forgets. Good content management could have saved these customers the headache and the company a possible sale. 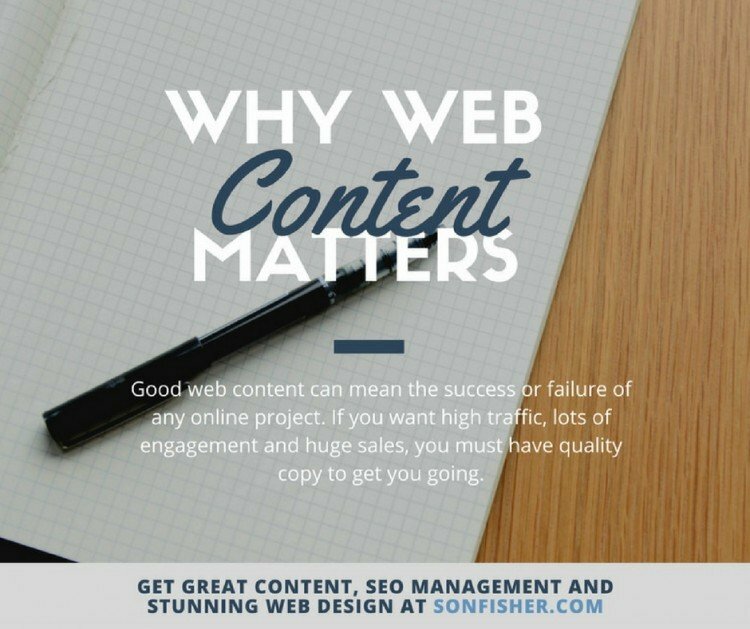 Good web content can mean the success or failure of any online project. If you want high traffic, lots of engagement and huge sales, you must have quality content to get you going. Here are three reasons why good web content writing is important to your WordPress site. Many small business owners hope that their services or product will speak for itself, but that’s not the case with a website. You must offer quality content to be successful. This includes your basic company info, common answers to questions, product descriptions and details, details, details. Visitor engagement is the main reason for repeat visitors. While some may come for your business info, most will not return unless they feel they receive some kind of benefit. This goes far beyond the basics. Company blogging, video series and social media are among the best solutions to encourage visitors that lead to sales. Great web content boosts customer trust and confidence. This means they come to you as the authority, instead of your competitor. Your brand appears professional and organized when your you have stellar web content. Have your product shine. Get a professional edge. Make your website work for you by communicating better, but most of all engage with your customers in meaningful ways through content management. If you want help with stunning copy-writing, give us a call. Infographic: Why Web Content Matters. Get the three major reasons you must improve your WordPress website content right now. About the Author: Linda Carlson is a UX designer with a love for wire-framing, planning and CSS at SonFisher Web Studios. For over a decade, she has focused her attention on small business needs and quality web services. Her writing includes content marketing, SEO localization and brand reputation.